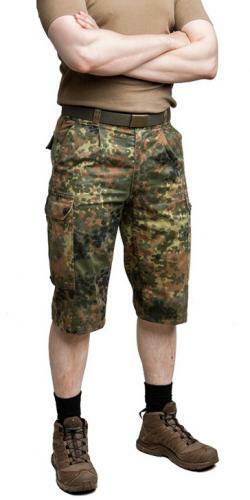 Genuine German army issue trousers cut down to shorts length by our supplier! 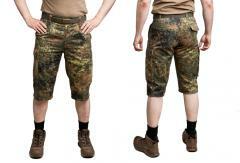 In short, if you like the Flecktarn trousers - and who doesn't - these are just the same, but better for hot summer! Like the older Moleskin trousers, these are rather simple and practical field trousers: zipper fly, about 3 cm wide belt loops and buttons for suspenders. The trousers have five pockets; two front pockets, one back pocket with a button and two cargo pockets, which are closed with two snap fasteners. The right side cargo pocket has a smaller pocket inside for a multitool, chocolate bar or whatever. The shortening job has been done professionally by East German labour in an unheated factory. The leg ends a few cm below the cargo pocket. Sizes in waist / inseam in centimetres (inseam is measured from the crotch to the end of the leg). In the brackets you'll find the original BW trouser size. The inseams used to vary, but after shortening they are all 36 cm or a bit more. I take a size 7 (85/80 cm) in the full-length version of these. I bought a pair of the size 2 (85/75 cm) in the shorts. I can confirm that the cargo pockets and everything else are in the same place on both. Looks like the only difference was leg length, so now they're all the same length just choose anything that matches your waist. Hemming on the shorts is neatly done. I'm 180 cm, the shorts end at the bottom of my knees when standing, a good length. They fit well and were in great shape. Nicely done. Got my normal pant size, and just as described, they fit perfect. I got a pair that was pretty much like new, no repairs, barely any fading... and these will last! Thank you Varusteleka; I don't know how you manage it, but you've got some of the best prices, some of the best variety and best shipping charges and I always seem to get my things within a week. Ordered Monday, received Friday.. and I'm in Canada. Really, the best surplus store I know. 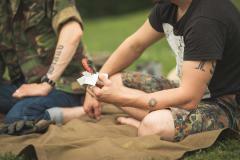 Flecktarn shorts! These are just cool. I have 4 pair. Some are a few inches longer than others. A couple pair I am having altered as the look like Capri pants from the 80's . Some are a little faded but solid as could be, a couple came quite nice. Only repair I saw was a button replaced . I laughed as these come with 4 extra buttons if you don't wear suspenders. These are REALLY comfy shorts, work well with the Särmä boxers too! I am very pleased with these shorts, they are VERY comfortable and not that bad looking. I went ahead and ordered them based on my normal jean size. I personally went with size 8 (35 waist, I was accounting for shrinking) Typically I am a 33/34, they fit wonderfully. Only sad part is that the thread holding the buttons are coming undone, but its surplus. I expected this at least, easily fixable at home if you know how to sew a little. Would and probably will buy again! I was very happy with my tropentarn shorts from last year, so when I saw these flecktarn were available in my size, I jumped on them! These are heavier, double-layer material in comparison to the tropentarn version I already had. Same great quality, but remember these are made from *used* surplus trousers, so there is some minor color variation between them if you order more than one pair [if they have your size, buy all you can! But leave 1pr for the next guy...] The long inseam on these 'shorts' means you can shorten to your preferred length later if you like: these are *really* long by normal standards, but I found I kind of like them after getting over my initial shock. 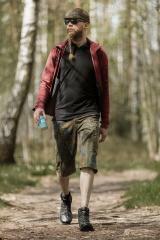 Long shorts or short knickerbockers, you decide... I believe the fashionistas call this length "clam diggers?" Anyway, I normally loathe cargo shorts because the cargo pockets are in the wrong spot & stick out too far; these, like their tropentarn siblings, put the pockets at the right height and have a lower-profile pocket just thick enough for a decent wallet. Only downside is the pockets are wide enough that my cell phone can rotate & lay on its side, and deep enough that when it does that, it requires a bit of a stretch & bend at the waist to fish it out of the pocket. C'est la vie! Oh, and besides having built in suspender buttons for those who wear them, THEY HAVE THE PROPER # OF BELT LOOPS [that would be EIGHT] so the waist on the pants is always supported & never sags or shifts. Someone in the BW knew how to make a proper pair of pants, and Varusteleka took them the rest of the way & turned them into some awesome shorts!